Strolling around the V&A just before Christmas, I came across Cornelia Parker's Breathless, which was made in 2001 and has been in the museum's collection since, I think, 2005. * It's made of 54 brass instruments that have been flattened, silver-plated, and suspended on thin steel wires. They float, these trombones and trumpets and tubas, between two levels of the museum, occupying a hole that was opened up where a ceiling and floor used to be. Above all, perhaps, Breathless is a meditation in glinting silver on music and silence.† Squashed, the instruments have had their wind, and their speaking power, squeezed out of them. Their mouthpieces will no longer be met by an embouchure, their valves are jammed, their water keys are useless, their bells need no longer be fitted with a mute, for they are mute indeed. Yet for all this, their outline is still unmistakable – they could be nothing but brass instruments – and they shimmer in their silence with a ghostly new life. * More on Breathless can be found on the museum's website, here. § Thank you to a reader for enlightening me further about this. It turns out that the hydraulic mechanism that raises Tower Bridge was used to squash the instruments. Apparently there is a label somewhere in the museum that explains this, but I missed it; my mind must have been full of the Gothic Revival furniture that I'd just been looking at, and the wonderful Christmas carols that were being performed live somewhere in the museum, their sounds floating up through the squashed brass ensemble to the spaces above. The aisle was full of noises. ¶ If you hear the clash of symbols in this sentence, remember that it's not only the high seriousness of the most highly serious classical music that's at stake here. Think of what Louis Armstrong could make a trumpet do, or Jack Teagarden a trombone. Such musicians can be poignant and jocular by turns. Silencing them is pretty awesome too. † Where there is music, there must also be silence. Silent and listen are anagrams, as Alfred Brendel, for one, has noticed. One of my most popular posts of 2016 has been the one I did back in August on the floor mosaics by Boris Anrep at the National Gallery in London. These lovely floors in the old gallery foyer, hardly noticed by many gallery-goers who are, not unnaturally, keen to look at what's on the walls, are a project of the 1920s by an artist (a Russian who had settled in England) making his name in the medium of mosaic. My earlier post concentrated on their wealth of contemporary portraits – Anrep's friends and acquaintances pose as personifications of virtues or pleasures, or as the nine Muses, and they're mostly a cross-section of cultural London, from Bertrand Russell to Margot Fonteyn. They contain more than a hint of the exotic, but many of their subjects are quintessentially English, as if Anrep is paying homage to the qualities of his adopted country. The pleasures of life include universals such as Dance (this being the 1920s, it's the Charleston) or Speed (an invigorating ride on a motorcycle), but also very traditional British activities such as hunting, football, and cricket. One of the most British of all is the seasonal delicacy shown above. Christmas pudding, for my non-British readers, is a very rich concoction containing a lot of dried fruit, sweet spices, and alcohol. It is traditionally decorated with a sprig of holly and when served it is doused in spirits which are set alight, hence the flames in the mosaic. 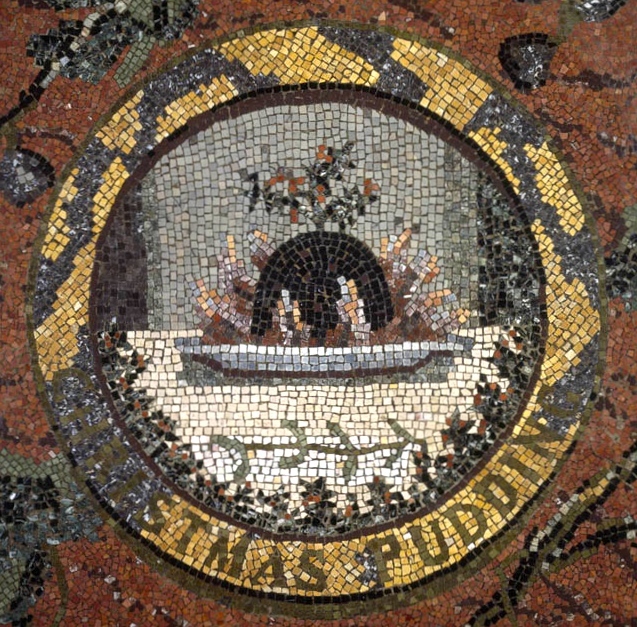 I am one of those who think Christmas is pudding is very much one of the pleasures of life, and I'm rather touched that the Russian Anrep thought fit to include this British dish in one of his mosaics. I offer it with all my best wishes to my readers everywhere. Thank you for reading the blog this year, and may you have an enjoyable festive season, wherever you are. The revised and extended editions of the Pevsner guides certainly do their job of picking out exceptional buildings in obscure places. 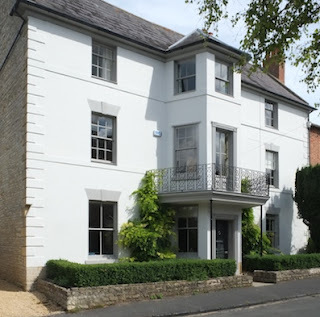 My example is the very last thing in the entry on Shipston: “with ogee windows and hood moulds; originally a police station and lock-up, built c. 1840,” says the guide, which was enough to send me off to find Old Road, where the building stands. 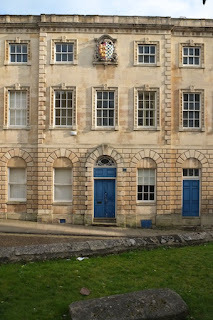 Those curving window tops are very typical of the early Gothic Revival and they’re certainly the first thing to notice. But I’d also point out the shape of the building – the broad curve with which it turns the corner. The metal glazing bars delineating tiny panes of glass and small three-pane opening panels are also delightful, especially their Gothic pointed upper panes. Backstreet England. As Pevsner shows, it’s so often worth your while to stray from the main drag, to go those extra few yards from your usual route, to poke around in corners. You never know what you might find. 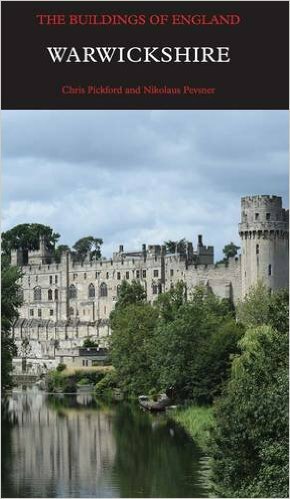 *The Buildings of England: Warwickshire, Chris Pickford and Nikolaus Pevsner (Yale University Press, 2016). My review is here. A search for a garden centre in Ross-on-Wye took the Resident Wise Woman and me to the the edge of the town, following green signs through an industrial estate. Having passed the modern sheds of the industrial estate, we arrived to find the garden centre partly housed in another kind of shed, a 19th-century engine shed built for the Great Western Railway. It’s in the very robust-looking mode that the GWR often used – chunky local stone, big segmental relieving arches, and a generous arch at the end (barely visible through the branches), that has been narrowed (when the railway switched from Brunel’s favoured broad gauge to standard gauge) and then filled in. Inside is a roof with a raised centre, held up with some very substantial timbers. The building seems to work well in its new use. *Monmouth Troy station was named after Troy House, near Monmouth. After it closed it was eventually dismantled and moved stone by stone to Winchcombe, Gloucestershire, where it forms part of the Gloucestershire Warwickshire Railway. 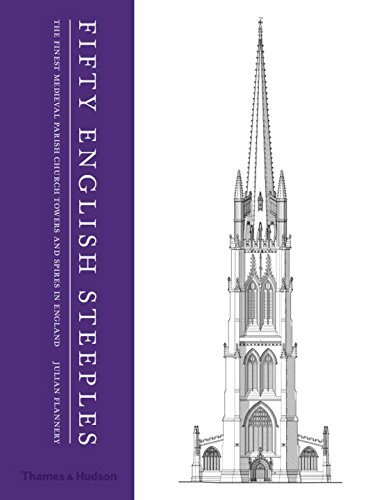 Fifty English Steeples presents author Julian Flannery’s selection of the finest medieval parish church towers and spires in England, from Saxon Earl’s Barton, Northamptonshire, to Louth, Lincolnshire (1515). They’re a varied lot: high and low, plain and ornate, square, rectangular, round, or topped with octagonal lanterns or spires. Their diversity comes shining out of the book’s many photographs and drawings – Flannery has surveyed all these towers himself, recording in painstaking and beautiful measured drawings their details of construction and design, and producing (for the first time) an authoritative list of their respective heights. The book would be worth having for these meticulous drawings alone. However, it’s much more than that. Flannery traces a steady design development, taking in various broad types of tower and spire – the round towers of Norfolk, the ornate towers of Somerset, the plainer but still magnificent towers of East Anglia, broach spires, recessed spires, spires with or without crockets, spires with flying buttresses, and so on and on. Along the way, he pays attention to the design of windows, buttresses, parapets, pinnacles, vaults – to make a compendium of steeple architecture of the kind that has never been gathered in one place before. The examples are all worth visiting and looking at. 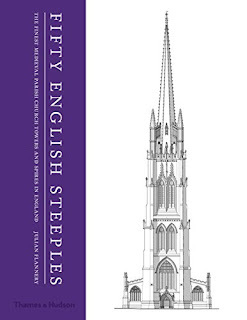 The book includes coverage of such triumphs of medieval architecture as the towers of St Cuthbert’s Wells, Leigh-on-Mendip, and Kingston St Mary (all in Somerset), Oxfordshire landmarks such as St Mary’s Oxford and Adderbury, great lantern towers like Lowick, Fotheringhay, and Boston, East Anglian monsters like Lavenham, and finally the great Lincolnshire spires, Louth above all. Louth is my personal favourite, a spire of unique gracefulness, and Flannery’s contender for the ultimate late-flowering of the medieval English steeple. There it is on the book’s cover above, 287 feet of glorious early-16th century architectural flair. Emerging from all this detail and all these examples is a broad pattern of development that has little to do with the conventional classification of medieval architecture (which works, up to a point, for window tracery and vaulting, but is less useful for steeples). Another theme is how so many of the best parish church steeples are either on or within striking distance of the limestone belt – not an invariable rule but a reminder that these structures are often showcases of the masons’ sense of being at home with their materials. A further theme is the effect of elements such as buttresses and string courses on the appearance of towers. Yet another is the varied ways in which masons made the transition from square tower to usually octagonal spire. The real triumph of this book is how it manages to look at an architectural phenomenon that we take for granted and subject it to new and revealing scrutiny. Its value is built on various foundations: thousands of hours at the theodolite and drawing board; an awareness of both exterior and interior impact; a balancing act between empirical analysis and an architect's aesthetic judgement. Above all it's the author’s good eye that is alert to qualities such as the strangeness of Patrington; the influential nature of St Cuthbert, Wells; the power of Boston's great relieving arches; the grace and sweep of Louth's tall openings and ogees; both the structural and visual impact of a buttress or a vault. Most of us appreciate the beauty and importance of England's towers and spires; thanks to this book we will see them more clearly and in more detail than they’ve been seen since they were built. My previous post about the Elephant pub in Bristol reminded me that there is one three-dimensional inn sign that I’ve been meaning to share with you for several years. This is the sign of the Unicorn in the High Street at Uppingham. This is no longer a pub but the sign remains to draw our attention to a building of various dates (17th to 19th centuries), with a rendered, pale-painted front. He’s rather heraldic, this unicorn, in his conventionally seated pose, and retains some nice details that generations of paint have not obliterated. The beautifully spiralling horn, the curly-ended leonine tail, and the collar and chain that look as if they ought to be gilded – all these details point to this being a heraldic unicorn, the seated posture and raised paws making it, in heraldic language, a unicorn sejant erect, I suppose. I do not know whether the beast belongs to a specific coat of arms, though. The Unicorn is not the most common pub name, although I’ve posted another one in the past in Oxfordshire. Uppingham’s must have stood out among the many inns in the High Street. Falcon, Bell, Crown, George and Dragon, Unicorn – this small town, like so many small towns, had numerous inns, and they were essential sources of hospitality and hubs of communication. They were one way in which country towns, which can seem just pleasant, quiet places to visitors today, once punched above their weight. And with a range of facilities from inns to ironmongers, butchers to bookshops, ones like Uppingham still do. I was so pleased to find this sign, because, like so many three-dimensional inn signs, it enhances a city street while paying tribute to a business that goes back centuries. Bristol’s Elephant Inn in St Nicholas Street was originally built in the 17th century, but was demolished in 1863 when the street was widened. 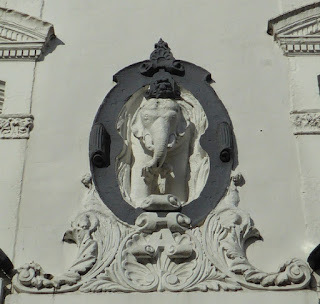 It was rebuilt, to a design by Henry Masters, in 1867, which is presumably the date of the carved elephant sign. Set among scrolls, acanthus leaves, and classical window surrounds, the sign stands out, and helps the facade stand out. It must have seen a lot over the nearly 150 years it has been here and it’s an unusual and memorable addition to my collection of three-dimensional inn signs, themselves a scarce but I hope not endangered species – a bear here, a swan there, a unicorn rare, white harts almost everywhere. Why do I like these signs so much? Well, it’s obvious on one level isn’t it? 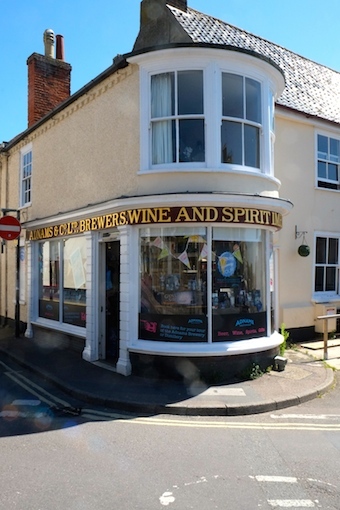 I like most things that enliven the streetscape with a bit of art or craft and most things that are distinctive – that show someone trying to be a bit different form the usual hanging pub sign, excellent as many of these are. But it’s more than this. Old pub signs seem to embody memories. They make me think of the decades of enjoyment that people have had here, of the bottles of wines and spirits, the succession of pints and pink gins that must have been consumed here. Places of hospitality. We need them more than ever in these tough times. ‘To th’Elephant,’ as Antonio says to Sebastian in Twelfth Night. * Cheers! Or what you will. St Swithun’s, Worcester, is one of my favourite Georgian churches. A typical town church, it’s hemmed in on all sides by streets and buildings – and by its 15th-century west tower, which is the only surviving part of the earlier church that stood on the site. 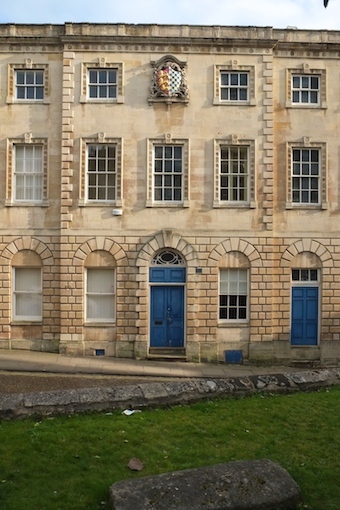 The present St Swithun’s was built in 1734–6 to designs by Thomas and Edward Woodward of Chipping Campden, who also refaced the tower and gave it a round-arched doorway. In this as in many 18th-century churches, it’s the interior that I particularly like, a welcoming space filled with natural light. The virtually untouched collection of box pews fit the nave beautifully, some facing towards the altar, some at the back facing inwards towards the aisle; there’s also a west gallery,* an impressive three-decker pulpit, and some terrific ironwork.† As you take all this in, your eye moves upwards towards the curving plaster ceiling. This is a beguiling confection, its ribs and corbels evoking Gothic architecture, while its roundels and garlands have a classical feel. Its pale white plasterwork reflects the natural light from the big windows down on to the pews, increasing the splendour of the interior. My admiration for this church meant I was sad to read on social media the other day that rain has penetrated the roof of St Swithun’s, damaging the lovely plaster ceiling. This ceiling is more vulnerable because, apparently, there are no nibs or keys§ attaching the plasterwork firmly to the wooden laths that should be supporting it. The Churches Conservation Trust, who look after this church, are of course aware of the problem and are on the case. There is a fund-raising scheme in progress at the moment to obtain funds not only for retiling the roof and other repairs, but also to create craft skills apprenticeships, and to make the building available for artistic exhibitions and performances. As usual, the Trust deserve out support. *This gallery is built up against the west wall, which is also the outer wall of the tower, the diagonal buttresses of which are still visible in the interior. †The ironwork includes not only the altar that I illustrate but also an ornate sword-rest rising from the mayor’s chair – a subject for a future post, perhaps. §Keys or nibs are the bits of base-coat plaster that the plasterer pushes between the laths to ‘key’ the plaster to the woodwork. When I give talks about building materials or vernacular architecture, this picture sometimes elicits a gasp of amazement. 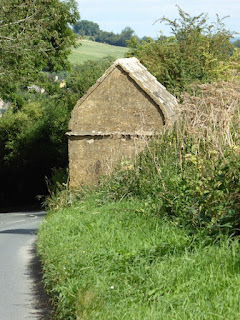 A field wall, made of cob (here a mix mainly of mud and chalk I think) and roofed with thatch. Such a thing seems eccentric these days. People think cob must be an ephemeral material – but it can last a lifetime with the proper protection, given, in the old phrase, ‘a good hat and a good pair of shoes’. The hat is provided by tiles or thatch. But thatching is a skilled trade and roofing a wall like this takes a lot of effort and expertise: it must be a costly process. In past centuries, though, the cost of materials and transport could be a larger proportion of the total bill of a typical building project, and both time and labour could be cheaper than they are now. In the Middle Ages, if stone was not plentiful, mud and thatch could at least reduce the cost of the materials. And yet, clearly, people who could afford to buy stone and bring it to the site also just liked the idea or the look of an earth wall. In c. 1320 at Lambeth Palace, London home of the Archbishop of Canterbury (who could have had stone for the asking), six perches† of garden wall were repaired and rethatched with reeds. Mud or cob walls for fields and gardens are not so common now, but you still find them in some places. I’ve come across them in Northamptonshire, for example. Chalk areas (parts of Wiltshire and Buckinghamshire, for example) also have chalk walls, similarly thatched. I hope people still like them enough to make the effort to maintain them. *Cob: a building material made from mixing earth and straw. Lime may be added and in some areas the cob can contain a large proportion of chalk. In Buckinghamshire, especially in the Haddenham area, chalk cob is known as wychert; in Cornwall cob is also referred to as clob. † A rod, pole, or perch: an old measurement equivalent to 161/2 feet – just over 5 metres; so six perches would be a good 30 metres: quite a bit of wall. A lot of people like a fox. Attractively red-haired, bushy-tailed, and proverbially cunning, foxes capture our imagination somehow. They’re dog-like, but a bit wild. At least since the ancient Greeks* they’ve been admired for their resourcefulness. So if you’re actually called Fox, and you’re a shopkeeper, you must feel almost obliged to use the animal’s image in your publicity and on your shopfront. Like the wonderful Fox umbrella shop in London Wall. This is a delightful frontage that reflects the high fashion in retail architecture in the late-1930s. On one level, it’s very simple: just a plain rectangular window to set off the goods on display, a big name sign, the latest in black cladding – and the foxes, of course, on either side of the name. But on another level this is a very elaborate and expensive confection. The metal window frames are stainless steel. The black cladding is Vitrolite, a coloured glass sheet material that was very popular in the 1920s and 1930s because it looked good, shed the dirt, and was available in the fashionable hues of the time – pink, eau de nil, black.† The windows had curved non-reflective glass. And that simple three-letter name plate is not so simple either. The steel letters light up at night thanks to neon tubes, also highly fashionable. However, creating a good shopfront isn’t solely a matter of using the best, most fashionable materials. It’s also about arranging them artfully. 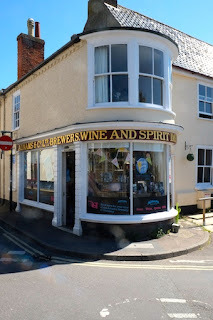 The long rectangular window, for example, is a not quite as tall as many shop windows: this gives an almost cinematic feel, as well as allowing plenty of height for signage and the fascia, so that the short shop name can make its fully impact with large letters. Another artful touch is the way the steel letters of ‘FOX’ are edged in red, giving just a bit of colour during the day (there’s more at night, of course, with the neon lighting). Mr Fox’s shopfront is the bee’s knees. The style of the shopfront reflected the quality of the products sold within. 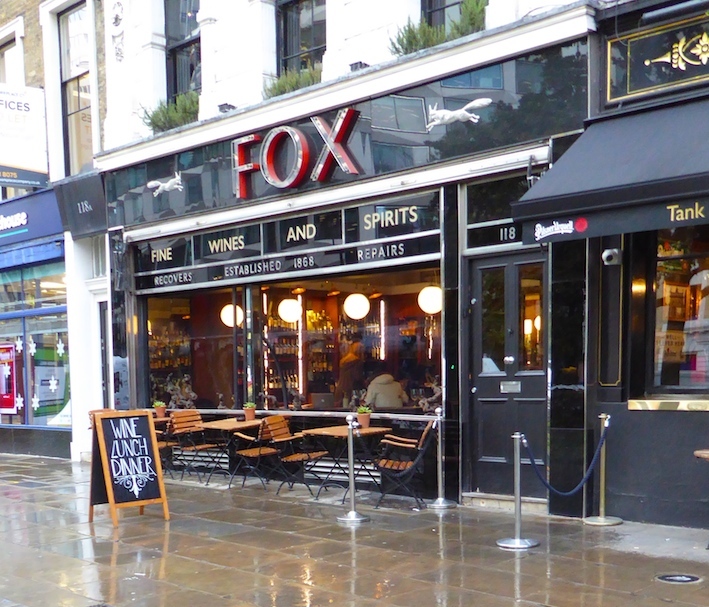 Apparently Winston Churchill used Fox umbrellas, and that personification of 1960s television style, the character John Steed in The Avengers, played by Patrick MacNee, carried an umbrella by Fox. The company still exists, though they no longer trade at London Wall.§ The premises are now given over to fine wines and dining, but the only concession to this is one line of signage below the shop name. The rest is still intact and glistening. Rain or shine. * The poet Archilochus has a fragment, variously translated, that contrasts the fox and the hedgehog: ‘The fox knows many things, but the hedgehog knows one big thing’, or words to that effect. And these days, foxes are all over greetings cards, on which they’re nearly as popular as hares. † Vitrolite was used in the bathrooms at the Savoy Hotel. See my post here. Regular readers of this blog will have noticed my liking for market buildings of all kinds, from medieval mutli-arched halls to the glass-roofed markets of the 19th century. I also like market crosses – the focal points of market activity that still stand in many towns, many of them medieval and elaborately carved. Market crosses, like this one at Shepton Mallet, are partly shelters for stall holders, partly three-dimensional signs to indicate the site of the market, and partly religious buildings that reminded medieval traders and shoppers that their business took place under the eye of God – and probably that deals agreed under the cross had an oath-like and binding force. 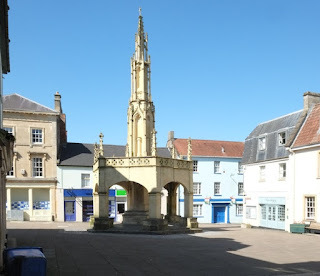 Whatever the exact story, the market cross still forms a focus in the town square.† Shepton is, I think, no longer quite the bustling place it was – although I was last there on a quiet Sunday and it may well be busier during the rest of the week. But the town has obviously looked after this beautiful structure for over 500 years, and I hope it attracts more people to the town’s shops. I hope to be back soon on a weekday, when they’re open. * For example, the website gives evidence for work on the cross in 1841, with various accounts including one that says only the upper part of the cross was rebuilt at this time – though we are not told exactly what ‘rebuilt’ means in this context. However, this online account is itself a very shortened version of a much longer study. See the website for more details. † One more thing hat adds to the historical interest of the market cross is an old iron road sign, attached to one corner, that shows distances to various towns and cities. I did a post about this sign some time ago, here. Among my recent posts, one of my personal favourites (and if web statistics are anything to go by, one of my readers’ favourites too) is one I did in August about the mosaic floors in the National Gallery, created by the Russian-born artist Boris Anrep, starting in the 1920s. * Anrep adorned one other London gallery, the Tate (now Tate Britain), and these mosaics are just as fascinating, though not quite so easy to see. The Tate was damaged in a Zeppelin raid in World War I, and after the hostilities ended needed a new floor in one of the octagonal corner galleries. Boris Anrep, who was yet to do his bigger floors in the National Gallery but had established himself as a mosaic-maker of some flair, offered to make a mosaic floor for the room. Better still, from the gallery’s point of view, he was prepared to work for nothing if no funds could be found. This suited Charles Aitken, the gallery’s keeper, although as it turned out he was able to secure some money for Anrep’s materials, and Anrep settled on illustrating eight of William Blake’s proverbs, this being a room, at that time, where some of the gallery’s considerable Blake holdings were displayed. The proverbs are of course very Blakean: ‘Exuberance is beauty’, reads one; ‘If the Fool would persist in his Folly, he would become wise’ is another. There’s quite a lot of tension in these mosaics. In ‘The fox provides for himself, but God provides for the lion,’ the lion has a bottom-up pose, a spiky mane, and prominent claws: a well-fed and powerful feline. The fox by contrast in long and rangy, with matchstick legs: providing for yourself can be a hard business. ‘Expect poison from standing water’ has a different kind of tension: the female figure seems about to drink, but the restraining hand of God hovers above – will she heed it? These striking mosaics are easy to find. Blake’s works have been moved elsewhere and the octagonal room is now given over the the Tate’s print sales area. The gallery have tactfully positioned the display units so that they do not cover the main parts of the mosaic, but the floor cannot have its full effect, and it’s hard to photograph some of the panels without also including bits of the gallery’s tasteful grey display units in the frame.† However, the mosaics are well worth searching out, and one can understand the excitement that attended their unveiling in 1923. The general praise for Anrep must have helped him secure the National Gallery commissions a few years later and the Tate had a colourful new work of art, full of exuberance and beauty. * This earlier post also has more information about Anrep, which I have not repeated here. † There is also a certain amount of reflection from the lighting, which I have tried to minimise but which can still be seen in the photographs. Once or twice I’ve walked down one of the sets of steps by the River Thames in London, to take a photograph from the shore. I’ve always felt a bit uneasy down there (Should I really be there? Will I be apprehended by a River Policeman or some imagined embankment beadle?). But I’ve also wondered what it would be like to be a mudlark, walking slowly along the shore and scavenging the historical detritus – old clay pipe stems, bits of pottery, colourful chunks of glass, the odd Victorian lemonade bottle – that gathers there. Now I know. Ted Sandling’s enchanting new book reveals what it’s like to be a mudlark, and tells stories from London’s history, based on the fragments he’s found down on the shore. It’s a winning way to look at history, juxtaposing photographs of the finds with narratives about their origin or use or context. Sandling makes bottle stoppers speak to us about the history of London’s consumption of mineral water; bits of glass reveal an international industry embracing Asia, the Levant, the Mediterranean and the Adriatic; an ink bottle has things to tell us about the history of literacy; pins provide evidence of early mass production; and so on. There’s a very special immediacy about the connection with history. You pick up a bit of clay pipe stem. It’s one of the most common things to find on the shore, but you may be the first person to handle it since its owner threw it away, broken and useless, 200 years ago. It’s very intimate, too, this connection. That original user put his lips to that stem; another grasped the wine glass of which you’re holding a fragment; yet another curled his wig with those curlers. Some of the fragments animate very specific stories. A bit of glass marked ‘ECKHAM’ and some bits of letters that look like ‘Manwaring’ lead to the origins of a South London pickle manufacturer. ‘BATTERS’, ‘ENGLAN’ and a bit of ‘Morgan’ is evidence of a firm making patent ceramic crucibles (first in Wales, then in Battersea, then back in Wales again). They were the state of the art then, and they still exist as manufacturers of crucibles – and, now, of parts for jet engines too. There are even bits of buildings washed up by the tide. A chunk of masonry from the old Palace of Westminster that burned down in 1834 is a prize exhibit. Delft wall and floor tiles are no less fascinating. And I learned, in the course of a passage about a wine bottle neck, that bottles as well as buildings had string courses. Such things, the objects themselves and the short accounts of them, do not lose from being fragments – visually, they are stunning, and historically they exemplify how the past comes to us in fragments that we have to piece together. Sandling’s enthusiasm for his material is infectious. He can luxuriate in the coloured decoration on a tile, the glow of a piece of glass, the texture of anything he holds. 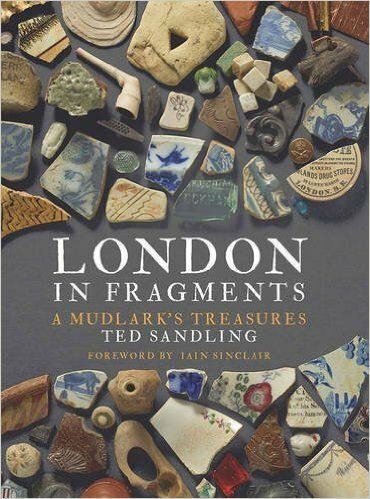 He’s good at recreating the surprise of discovery and the strangeness of some of the finds – some of them, after all, have taken long journeys to get here: the river both is the essence of London and is something flowing into it from outside. Even what were everyday objects – a pipe bowl in the shape of a horse’s hoof, a Tudor money box – can seem strange until their stories are filled in, and Sandling is good at getting this sense of strangeness, as well as giving us the background information we need to understand the objects better. He recognises, too, that odd, uncertain feeling that I felt when stepping on to the mixture of sand, gravel, and mud beside the Thames. Nearly everyone feels it, he says, when they first go down there. Bottles and buttons and bear heads (yes) and writers and mudlarks too, we are all strangers on the shore. The arrival of a new revised edition of one of Pevsner’s Buildings of England volumes has me rubbing my hands with glee, especially when it’s on a county in my local area. As I live in north Gloucestershire, not so far from the border with Warwickshire, the new edition of Warwickshire is right up my street. Pevsner’s original Warwickshire came out in 1966, so a full update was due. As seems usual these days, the new Warwickshire has 800 pages (there were just 529 smaller pages in the 1966 edition), but unlike its processor it doesn’t include Birmingham, which will appear in a forthcoming volume on Birmingham and the Black Country. There’s plenty of space, then, for new extended entries on Warwick and Coventry Universities, and for many individual new buildings (Pevsner’s account of Coventry Cathedral, a new building in 1966, is reproduced with little change, apart from some notes on recent minor alterations and additions). The old buildings (and there are some belters in this county: Warwick and Kenilworth Castles, Baddesley Clinton and Stoneleigh Abbey) are covered in more detail. The book also includes much more information about many places – small towns such as Bedworth and Atherstone, for example, are covered in much greater depth. We get a richer picture of this fascinating county as a result. One huge gain in the revision process is the scope to draw on the results of new research about all kinds of buildings. Recent books on the architect Sanderson Miller (very active in his native Warwickshire) are a case in point. Andor Gomme’s work on the architect and builder Francis Smith of Warwick is another. Recent research also throws light on the designers of important houses such as Compton Verney. And on rediscoveries. Why didn’t the 1966 Pevsner tell me about the wonderful Norman tympanum in the church at Billesley, I wondered? Answer: because it was only rediscovered in 1988! The new book includes it, and provides a photograph of it too. It didn’t take long before I got out and about with the new Warwickshire in my hand. It throws light even on places that are familiar to me, as I discovered when I took it on a journey through parts of the south of the county. There was much more than in the original book on the large village of Brailes, for example, and about smaller ‘hidden’ places like Idlicote, with its church, house, and dovecote, and about places I’d driven through hundreds of times, like Halford, a village on the Fosse Way with a good church (another bit of excellent Norman carving (who said Herefordshire had all the best Norman sculpture?) and some elegant early-19th century houses. I finished my trip in Shipston-on-Stour, which I thought I knew like the back of my hand. But the Pevsner encouraged me to explore more closely a former nonconformist chapel I’d overlooked before, and introduced me to a bit of the town I’d not visited, where it pointed me towards an extraordinary former police station with, of all things, 19th-century Gothick ogee windows. So Warwickshire doesn’t disappoint with the familiar places. And I’m already noting down buildings I don’t know that I want to see. I think the list will continue to grow for some time. 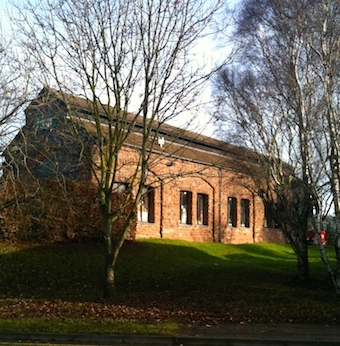 Anyone with any kind of interest in Warwickshire, its history, and its buildings, will I’m sure react in the same way. There’s no need to hesitate to buy this latest Pevsner. 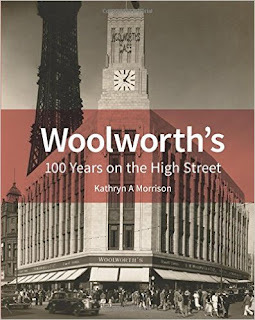 From 1909 until their demise in 2008, Woolworth’s* was a ubiquitous and familiar name on Britain’s High Streets. Selling, at various times, everything from children’s clothes to gardening equipment, recorded music to sweets, they were famous above all for low prices and good value. Woolworth’s red-signed store fronts and signature lines (pick n’ mix) were so familiar that they were taken for granted. Everyone was shocked when they closed. Kathryn A Morrison, historian of retail architecture, is well qualified to chronicle the American company’s story in this country, with special reference to the way in which they designed, decorated, and arranged their stores. She begins with the man himself, Frank Winfield Woolworth, the American entrepreneur who built up a huge and successful chain of fixed-price nickel-and-dime stores before exporting the idea to Britain. She charts the company’s progress through the challenges of World War I, the subsequent recession, World War II, the post-war reconstruction, and the peak of the 1960s when the company had some 1130 outlets and had reached saturation point in Britain. There follows the sad decline, with the company making repeated attempts to revive the business with new names and approaches (Woolco, Shopper’s World, Woolworth by Post, Savermarket, Furnishing World, Kidstore, etc, etc), restructurings, and redesigns, before the final closure in the relentless economic crash of 2008. 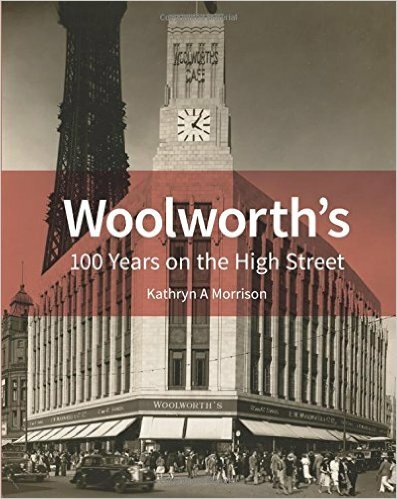 This story, fascinating in its own right, is just the background to the main subject of this book, which is the history of the way Woolworth’s designed and presented their stores. At the beginning it’s a canny tale of careful choice of sites (near bus stops and railway stations), enticing signs and window displays and notices assuring the customer that everything inside cost just 3d or 6d, of drawing customers in with weighing machines in lobbies, of creating an identity with Classical facades and carved stone lions. Morrison shows how the stores were distinctive inside too, with goods laid out on open counters rather than out of reach as was normal then. This arrangement proved an irresistible temptation to shop-lifters (early reports showed stolen items ranged from soap, combs and scissors to a tortoise – a revealing snapshot of the sort of stock that was carried). Later highlights from the history of Woolworth’s architecture and design include big Art Deco and Moderne frontages from the interwar period, more stylized Classical fronts for smaller shops, and a restrained neo-Georgian style that seems to have been adopted in response to the increasingly strong 1930s conservation lobby. All these styles were being built at the same time, but the stores were unified visually by motifs from the bright red signage to the use of a distinctive ‘W in a diamond’ monogram that became closely associated with the company. The design of everything from cafeterias to counters, window frames to pressed-steel relief panels, is noted along the way, and illustrated in a rich array of period photographs. Period photographs, indeed, dominate – a lot of these stores have gone, or have been very thoroughly adapted. But there are hints and traces of these formerly glorious stores all over the place, and Morrison shows us what to look for and where to find it. She also features some of the outstanding stores that remain with little alteration to frontages at least. The 1930s shop in Monmouth (original windows at street level, stylized Classical brickwork above), the flagship store in Lister Gate, Nottingham, all faience fins and mouldings like an Art Deco cinema, and Ledbury’s small-town neo-Georgian outlet are the stars here. I have space only to mention a tiny fraction of the fascinating things in this book, which throws light on subjects as varied as the company’s treatment of its staff in the early days to their change from leasehold to freehold properties and how this affected their growth. Morrison’s book is wonderfully revealing about the design and history of a business that was a familiar, and much loved, presence in Britain for a century and is essential reading for its insights into architectural, retail, and social history. 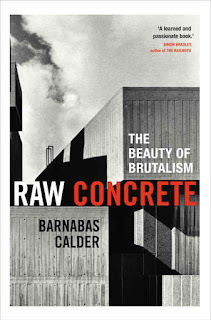 Over 300-odd pages, Calder presents a detailed account of a clutch of Brutalist buildings, documenting their history, anatomizing their design, and explaining what’s good about them. Several are the usual architectural suspects in London – structures such as Ernö Goldfinger’s Trellick and Balfron Towers, the vast Barbican development by Chamberlain, Powell and Bon, and Denys Lasdun’s National Theatre. There are also less well known and more far-flung but equally interesting buildings, like New Court, Christ’s College, Cambridge, and buildings I’d not thought Brutalist at all, like Stirling and Gowan’s Engineering Building for Leicester University. And there’s the commercial Brutalism of Richard Seifert, the architect of London’s Centrepoint block. They all throw up memorable stories. We meet the rebarbative Goldfinger getting angry that someone in his office isn’t working and sacking him on the spot; the victim turns out to be a visitor. We get insights into the struggles between architects and builders at the Barbican. We marvel at how Denys Lasdun coped with multiple and contentious committees when building the National Theatre. And we meet Sir Leslie Martin, the quiet man of Brutalism, overseer of so many projects for the LCC and mentor to so many young architects. Along the way, Calder tells us a lot about concrete. That, after all (and notwithstanding Jim Stirling’s red buildings, which flaunt their red brick and problematic glazing) is where Brutalism begins, with béton brut, the raw concrete of the title. Calder loves this material but his is not an unquestioning love. He loves it most when it is good quality concrete. And although many people think of concrete is a cheap material, good concrete isn’t cheap. His accounts of the hammered concrete at the Barbican make this clear. Bush hammering produces the artistically roughened surface that makes much of the Barbican so impressive. You get it by hammering off the topmost layer. But that doesn’t mean you can pour the concrete any old how. Concrete destined for hammering has to be just so before you set to work with the hammers – if it’s not, the stuff breaks off unevenly and you have a mess. And the hammering itself takes a lot of time, noise, and dust. It’s a tough job. Similar pains went into the production of the concrete at the National Theatre. Here it was poured in situ into wooden shuttering. But the shuttering had to be just right, and only reused once – more than that and it would not produce the crisp image of the wood on the concrete surface that is such as feature of the building. Structures like the National required as much craftsmanship as good brickwork or stone masonry. All this is conveyed with the author’s winning mixture of clarity and zeal. Calder talks about how the buildings work, too. And he’s honest about this. While thoughtfully explaining how well planned most of the structures are, he also admits some of their shortcomings, such as their energy consumption – they were built at a time of relatively cheap electricity. Even so, for Calder, these buildings are about as good as it can get. He’s always their advocate and his book is an enjoyable, informative, and entertaining read. A few weeks ago the Resident Wise Woman and I decided to grab an hour or two out and go over to the Rollright Stones, a prehistoric* stone circle that we’ve visited a few times before. I don’t know what it is about this place. Some say it feels spooky, others that it recharges their energies. I find it atmospheric – but very hard to photograph. My pictures of it seem to show expanses of grass with some tiny stones in the distance, or close-ups of stone that look like just…stone. My best effort was probably on a misty morning† when you couldn’t see the stones very well at all – at least there was atmosphere, even if it was mostly made of water vapour. Once we’d had a walk round, imbibed the atmosphere on this much clearer day, and admired the way people had been decorating the hedge with coloured ribbons, we decided to walk around the neighbouring field to look at a smaller, associated group of stones, the Whispering Knights. They’re probably the remains of the inner chamber of a neolithic burial mound. The earth mound has long gone and the stones now form a tight cluster. Huddled together against a background of the gently undulating Oxfordshire countryside they make it easy to see why people imagined them as a group of conspiratorial figures speaking to each other sotto voce. The Knights hold people’s attention just as magnetically as the stone circle. On approaching we saw that visitors have tossed coins that have gathered in a shallow depression in one of the lower stones; they have also left little twists of straw and a bunch of flowers. Offerings to the gods? To Mother Earth? Memorials to loved ones who loved this place? Or just encouragement to the people who look after the stones? Maybe all of the above. Evidence anyway of the ways in which people today still connect with this fascinating and haunting place. *The stones have their own website, here, which gives approximate dates of 2500–2000 BC for the stone circle and 5000 BC for the Whispering Knights. † My previous, misty encounter with the Rollright Stones is remembered here. The comments section to this earlier post includes accounts of various legends associated with the stones. Post boxes: readers who return often to this blog might have noticed that I have bit of a thing about them – I must have done at least half a dozen posts about post boxes over the years. Although they’re not strictly buildings, they’re built structures, and some were designed by architects. And the people who decide which buildings should be listed don’t have any problems with including them: there are quite a few listed boxes. A number of these are Penfolds, the lovely Victorian hexagonal boxes that celebrate their 150th birthday this year. They’re named for their designer, architect John Wornham Penfold,* and they are rather architectural in character, with the acanthus leaves around the top. They were made between 1866 and 1879 before being superseded by cylindrical boxes that were less costly to manufacture. Original 1866 Penfolds are quite rare. There are 20 of them in use on Britain’s streets, including a fair number in London and no fewer than 8 in Cheltenham†. So as I live near Cheltenham, it’s a local Penfold I’ve chosen to share with you. It’s rather special in that it still has the original white enamel flap over the slot, chipped and spattered with red paint, but still hanging there, helping to keep out driving rain and autumn leaves. 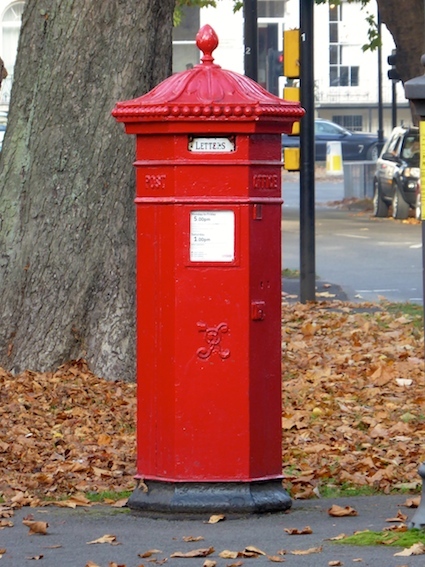 They weren’t always red, which became the official colour in 1874 (although it took a few years to repaint all the boxes). Before that this Cheltenham box was probably green. Penfolds are certainly effective in glowing Pillar Box Red, and it’s good to find them, showing off their ‘VR’ royal monogram, the bold legend ‘POST OFFICE’, and the lovely acanthus top with its strip of beaded ornament and smart finial. Among the trees, leaves, and miscellaneous and unglamorous street furniture of today, Cheltenham’s Penfolds still stand proudly out. * Penfold was a distinguished member of his profession. He became President of the Architectural Association and a Fellow of the RIBA. There’s more about him and his post boxes here. I'm also indebted to an article in NADFAS Review, Autumn 2016, for reminding me about this anniversary. † The total number of Penfolds in use, both 1866 examples and later ones, is about 70. As autumn approaches and the country houses and other attractions that many of my readers like to visit get ready to close their doors for the winter and cover the furniture in dust sheets, what else is there to get us out and about, and stimulate the optic nerve? Plenty of museums stay open all winter, and one of my favourites is the Jackfield Tile Museum, a rich collection of architectural ceramics near Ironbridge (it’s one of the cluster of Ironbridge Museums). * This is not just a Mecca for the tile aficionado. There’s plenty to interest anyone who’s interested in how British design has developed in the 19th and 20th centuries – Gothic revival, art nouveau, modernist, mid-century modern – all the expected movements are here, exemplified in colourful ceramics, many of them so lovingly decorated that they repay a really good look. Not only that, the museum does a good job of explaining how tiles are made and decorated, with video sequences showing encaustic tile making, tube lining, and so on, and, better still, the working Craven Dunill factory is next door, and open to visitors at certain times. People who like Piper will know that the artist had a fascination with the image of what he called the foliate head – a figure derived from the green man, though Piper’s versions are sometimes female, with foliage emerging from the mouth. This of course is an ancient idea: you can find green men in medieval churches everywhere and the figure of Jack in the Green, who turns up with some Morris sides, their dances marking the turning of the seasons, is clearly a member of the same family. Piper liked such ancient traditions,† applying to them his 20th-century technique which here comprises a combination of bold splashes of colour and flowing, painterly lines. I like this interplay between patches of colour and lines, and I like too the way Piper draws the different mouths of the four heads. I keep thinking of Matisse when I look at these tiles – both the cut-outs, so effectively shown at Tate Modern not long ago, and also the earlier fauvist paintings with their mix of strong colour and bold lines. But whereas Matisse worked on a big scale, Piper has managed to use this sort of boldness on tiles just a few inches across. His designs work well at this size. They’re a little more homely than the French master’s work, true. But looking at the mouth of the final tile, bottom right, Piper has not quite tamed the wild beast. *Details and opening times of the museum can be found here. §I have my own ideas about this, but I’ll let readers decide for themselves how they want to interpret the images. †’Foliate heads’ also appear on Piper designs for wallpaper and lampshades, and the artist also produced foliate head prints.